Set V of the English Lyrics, published in 1902 and dedicated to Parry’s youngest half-sister Hilda, contained several songs of a much earlier date, one of which was Proud Maisie written most probably during the 1880s. Scott’s poem (taken from chapter 40 of The Heart of Midlothian) is based on a well-defined dialogue between Maisie and the Robin which is underpinned by a tonal fluctuation of F major (symbolizing ‘proud’) and D minor (‘mortal’). This element is already anticipated in microcosm in the piano’s introductory bars which encapsulate both the sprightly and ironic sentiments of the text. The miniature scale of Lay a garland on my hearse has Wolfian affinities, particularly the postlude in the tonic major. However, one wonders whether Parry is perhaps making reference to Purcell’s lament ‘When I am laid in earth’ (the sound of which is actually concealed in bars 2-4) where the fullest pathos is reserved for the postlude. 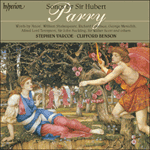 It is a tempting parallel, not least because Parry had paid much attention to Purcell in 1895 during the composer’s tercentenary; but the use of the tonic major in this context is pure Romanticism, as is the prominent Brahmsian harmony (‘My love was false’) at the climax.